Although I have posted a very similar photo before, I like this simple dual tone composition so much that I'm fine with posting again, for readers who didn't see it the first time a couple of years ago. I like it enough that I actually have a print of this hanging in my hallway gallery. The sun, setting over an icon of Disneyland Park, during brief time of the year when it is far enough north to be able to do so in the afternoon. Though my photography is usually about vivid, crisp, detailed wide angles, sometimes, it's nice to just go simple. 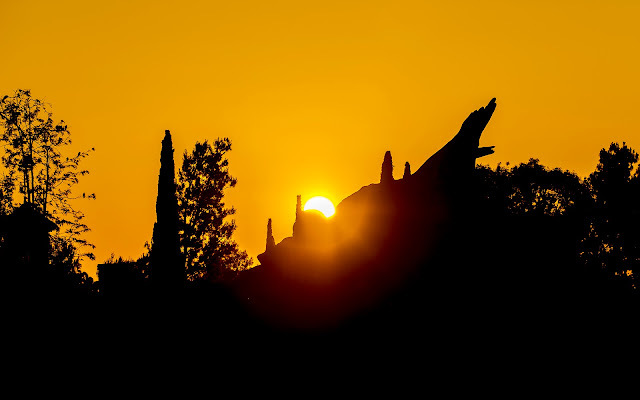 The sun sets over Splash Mountain, casting an orange glow over silhouettes.